Mascarpone that creamy filling that helps give Tiramisu it’s light yet indulgent texture. But what is mascarpone cheese ? And just what exactly can you do with it? It is not only in desserts that mascarpone makes an appearance it is also found in several pasta dishes and some rissottos. What is Mascarpone Cheese ? Mascarpone is made by basically taking cream and coagulating it with some form of acid. That acid for the most part is either lemon juice or some form of vinegar. The process is similar to how Ricotta is made. However that’s pretty much where the similarities end. Ricotta is produced from the whey, whereas mascarpone is made from the remaining curds. Mascarpone is produced from cow’s milk. It is one of many famous Italian cheeses along with Ricotta, Gorgonzola, Pecorino and Grana Padano or Parmesan. 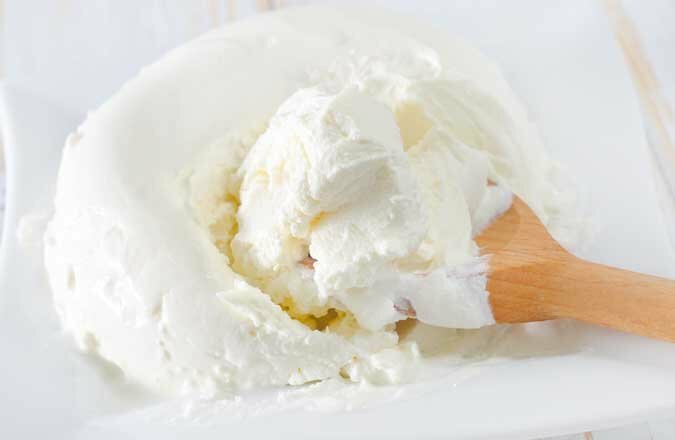 Mascarpone has a creamy yet light, smooth texture that is somewhere between whipped cream and cream cheese. It mixes well with cold liquids however care must be taken when adding it to anything hot. Add a small bit at a time and fold into the dish rather than stirring vigorously. It has a fairly subtle flavor on its own. However when it is used with a nice sweet flavor such as a fruit jam or honey it really starts to shine. Paired with something sweet it’s creamy taste and texture gives a great contrast. The rich flavor is due to the high butterfat content. If you are stuck without any mascarpone in your local store then there are a few alternatives that you can use as a mascarpone substitute. Ricotta is the obvious mascarpone replacement but because it has a lower fat content it may be best to use it only in savory dishes. It tends to have a lumpy texture than mascarpone so is not that suitable for sweet dishes. Crème fraiche and cream cheeses are also good in savory dishes. Alternatively you could also use a really thick Greek yogurt if you can get your hands on one. The yogurt in this instance is best suited to sweeter dishes like desserts. If none of the above are available you can make a sort of alternative to mascarpone from cream cheese and with some double cream and a little bit of very soft butter. You may need to play around with the ratio’s depending on the type of cream cheese and just how heavy the double cream is. If you are having trouble finding mascarpone where you live then fear not if you are really stuck and none of the mascarpone substitutes above are available then you can make your own. The prep time only takes about 10 minutes but you will need to leave it in the refrigerator over night. Place a deep saucepan with the cream in it over a low heat. Bring the cream to a fairly low simmer. Note: do not boil the cream. Using a thermometer is best. You want it to simmer at about 180 F.
Let if simmer for roughly 3 minutes. Add the lemon juice stirring gently to ensure it is well mixed. Let simmer for a further 3 minutes. Take off the heat and let cool for about an hour. Using a strainer with several layers of cheesecloth pushed into it add the mixture into the cheesecloth. Let it sit in the fridge over night and allow any surplus whey to drain. In the morning it should be ready for you to enjoy. For the most part mascarpone is quite readily available across the Us. However in some smaller towns it may be harder to find. You can usually find it in the fridge next to the crème fresh or the cream cheeses. The majority of mascarpone in the US is made in the US. However you may be able to find some importer ones from Italy in a specialty Italian food store or in a cheese mongers. But you should expect to pay significantly more for the imported versions than those that are produced on US soil. Mascarpone has a much higher fat content than cream cheese. It is made using an acid whereas cream cheese is produced using a lactic acid bacteria. « What is Gorgonzola Cheese ?